The Urban Heat Island Effect (UHIE), already a problem for cities across the globe, will be exacerbated as the planet gets hotter. Green spaces in cities are recognised as ameliorating the adverse effects of the Urban Heat Island. Urban areas have higher average temperatures than surrounding countryside. This temperature difference is called the Urban Heat Island Effect (UHIE). As urban development increases, there is a reduction in green space. The hard surfaces in cities absorb heat, especially dark roof surfaces. By absorbing summer heat and radiating it out again overnight, roofs make the UHIE worse. As buildings heat up and the UHIE increases, so does the need for cooling. Air conditioning and therefore energy demand peaks. In one heatwave in 2013 in London, it was almost impossible to buy an electric fan. Furthermore, an increase in the UHIE can lead to increased levels of air pollution. Excess heat and air pollution lead to increased health risks, especially in the old, young and vulnerable. 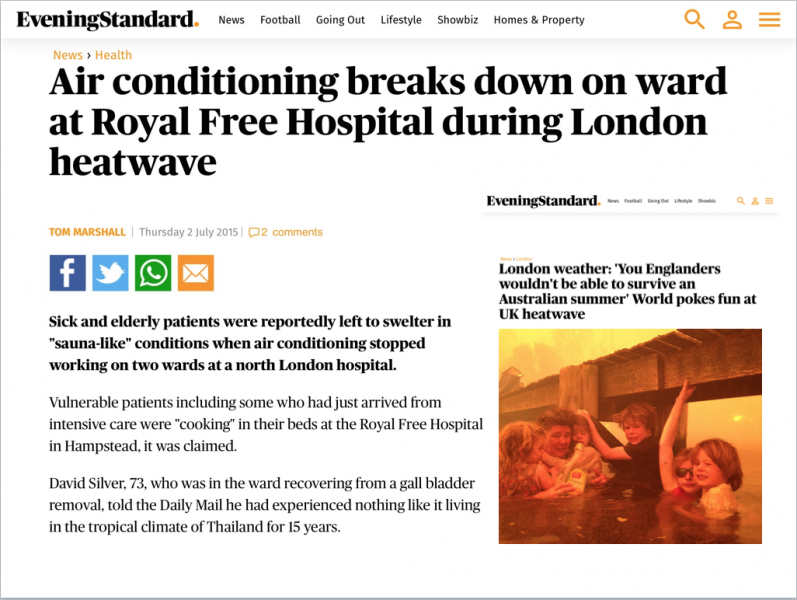 Not only does it affect individuals but even hospital wards can be closed, as happened in the 2015 heatwave in London. Green roofs, like other green spaces in cities, can have a positive effect on the UHIE. Plants and soils evaporate moisture. This evapotranspiration cools the air around the building. Thus, by providing a cooler surface at roof level, the green roof reduces the need for air conditioning during periods of higher temperatures. This can also help reduce the impact of the UHIE. One recent study concluded that sustainable urban futures demand vegetation, with the greatest benefit when green roofs and green walls are used, enveloping the whole building in vegetation. Such an approach could lead to up to an 84% reduction in cooling demand. A modelling scenario undertaken in New York by the New York Heat Island Initiative found that providing 50% green roof cover within the metropolitan area would lead to an average 0.1- 0.8ºC reduction in surface temperatures. Further, for every degree reduction in the UHIE, roughly 495 million KWh of energy could be saved. In response to this modelling, New York launched a tax rebate for building owners who install green roofs within the metropolitan district. In Toronto Canada, city officials estimated that the effect of greening the city’s rooftops would lead to a 0.5 – 2ºC decrease in the UHIE. A reduction of this magnitude would lead to indirect energy savings citywide, reducing energy for cooling by around $12 million. This is equivalent to 2.37 kWh/m2 per year. Importantly, it would reduce peak demand by 0.0023 kW/m2. In Japan, many cities suffer from the severe effects of UHIE. The average annual temperature in Tokyo has risen by 3ºC in the last century. This is four times higher than any effect attributable to global warming. In 2016, Cordoba in Argentina became the second city on the continent to mandate green roofs. One of the drivers for the new policy was the need to help reduce both the UHIE and air pollution in the city.